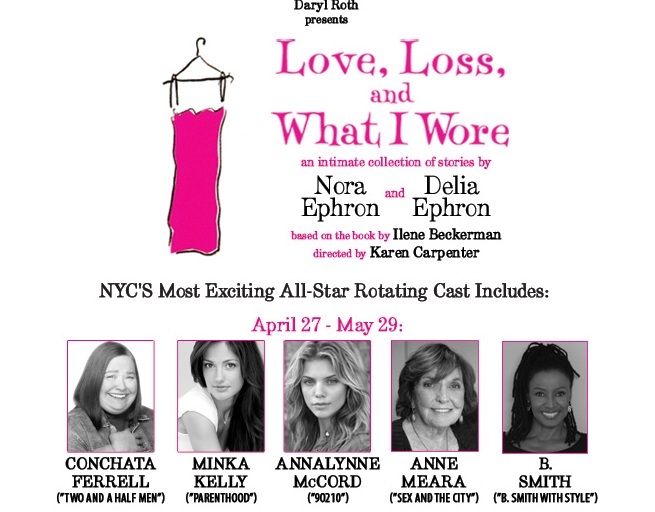 Love, Loss, and What I Wore, an intimate collection of stories by Nora Ephron and Delia Ephron is based on the best-selling by Ilene Beckerman, as well as on the recollections of the Ephrons’ friends. Like the book, the show uses clothing and accessories and the memories they trigger to tell funny and often poignant stories that all women can relate to. Directed by Karen Carpenter, the production is performed by a rotating cast of five all-star actors, who will perform in four-week cycles. Cast members have included Tichina Arnold, Samantha Bee, Mary Birdson, Alexis Bledel, Nikki Blonsky, and Katrina Bowden – just to name a few. Categories: Fashion and Beauty, Miss Metropolitan Junkie, NYC Events, Uncategorized, Urban Aristocrats, What's Hot in N.Y.C.